Minneapolis celebrates International Women’s Day 2011 | Fight Back! Minneapolis, MN - More than 50 people came together here March 8 to celebrate International Women’s Day. 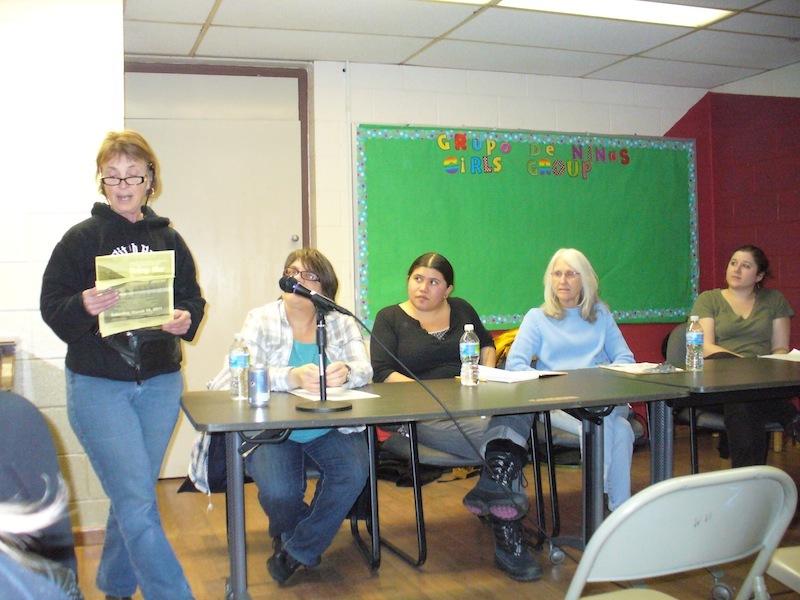 The event was sponsored by Freedom Road Socialist Organization and featured women who are in the forefront of the fight against repression and reaction. Speakers included Jess Sundin, a leader of the Anti-War Committee and Freedom Road Socialist Organization and one of the anti-war and international solidarity activists targeted by the FBI and grand jury; Sarah Jane Olson, former political prisoner from involvement with revolutionary movements in the 1970s; Tracy Molm, an organizer with Students for a Democratic Society at the University of Minnesota, also one of the activists targeted by the FBI and grand jury; and Luce Guillen Givins of the RNC 8, unjustly charged with felonies for protests at the Republican National Convention, 2008. Sarah Jane Olson talked about her experiences in prison and stated that she stands in solidarity with all of those who are facing FBI and Grand Jury repression. Tracy Molm talked about attempts to represses anti-war and international solidarity activists and the ongoing pushback. “...the case of Clara Zetkin, the founder of International Women’s Day. She was exiled from Germany under the anti-socialist laws there in the late 1800s. But she didn't give up. Almost 50 years later, she was 75 years old and at the forefront of the fight against fascism. Now, I know some very active and healthy women in their 70s today, but in the 1930s, that was pretty long in the tooth. “Her words ring just as true today, especially looking at my own life. Tracy Molm will speak later and talk more about our case, the 23 anti-war and international solidarity activists targeted by a Chicago grand jury. We have worked hard to build a broad front to push back against this attack, in defense of our movements, our organizations and the targeted individuals. In Clara's words, ‘all those who thirst for liberty’ should stand with us. And they do!